My clanning history extends back to the early 2000's, back then i was part of many clans from community clans like The British Elite up to some of the best pking clans of that time such as Reign of Terror, The Titans and of course Violent Resolution. Since i came back to Runescape in late 2017, i gradually became a more active player throughout 2018 when i joined Wilderness Guardians one of the few old clans i was able to find when i went looking for clans. P.S. 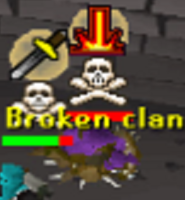 Just decided to add this little bit, its not really clan related but i tend to pk a lot at the moment with opened discords such as Community Pk and Toak Community. I was of course aware of VR from back in the day but for a long time since i came back to Runescape i wasn't aware that VR was still around, until late 2018 when i ran into VR during a WG pk trip. Since then i have gradually started to see more of you guys around and my friend Akadian has started macing with some of you guys which kinda peaked my interest as a possible step into a more PvP focused clan. I am currently strongly considering it, im only 93 mage at the moment so i have to get one more level before i will be able to join and be fully useful in all situations. I am a 25 year old male from Glasgow, Scotland. I am currently unemployed and spend far too much time playing Runescape. My main interest in the game is Pking but i have more interest in PvM than i do in skilling. If you have any more questions feel free to @ me in VR's discord and will be more than willing to answer them. I quit for just over 9 years and tbh i cant remember it anymore, still kinda disappointed about it lol. Tho i have seen a few old familiar names around, not many but some.